Here’s a handy index for all the articles relating to the hand embroidered Christmas ornament series that finished this week. The index will be listed under Tips & Techniques in the main menu on Needle ‘n Thread, under Hand Embroidery Lessons & Step-by-Step Projects, where you can find a list of most of the embroidery projects and lessons we’ve gone through together over the years. 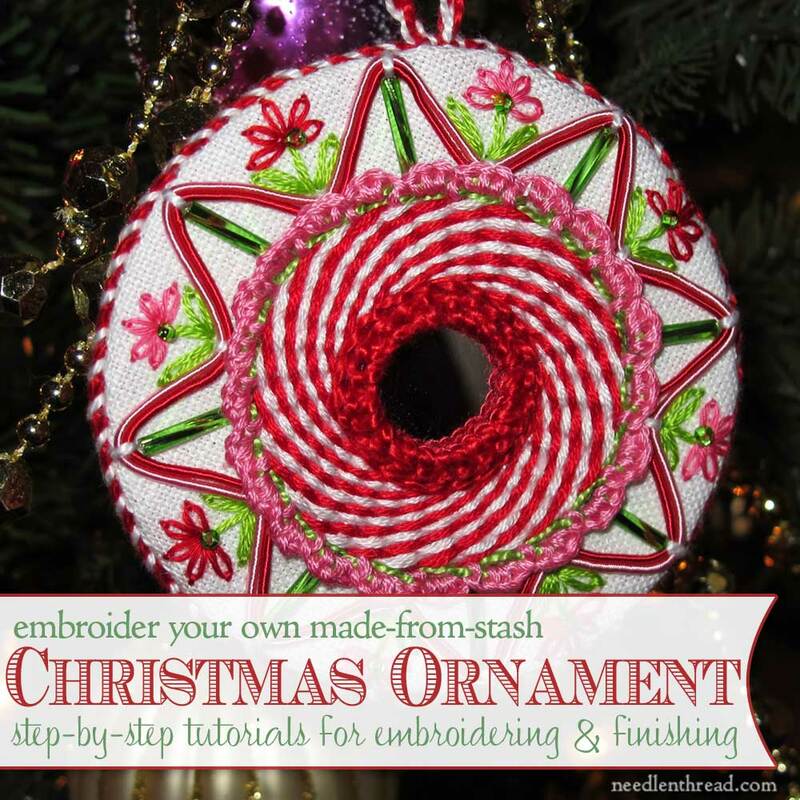 How to Embroider a Ruched Silk Ribbon – makes a great little wreath! I had so much fun making this ornament, that it isn’t impossible I might do something similar again next year. Oh, not the same ornament, of course – but some kind of ornament. Hey, I might even start it earlier, if I can remember to plan ahead – but that’s a Mighty Big If! Wishing you a restful, quiet, relaxing Christmas Eve – safe travels if you’re traveling, and good cheer if you’re staying home! Thanks so much for the Christmas ornament index and I can’t wait for your return with yummy delights I do hope you have a great Christmas in whatever you will be up to and I hope you have a restful time. Enjoy your time off from Needle n’ Thread although I will miss our chats together but you deserve a break and what better then celebrating Christmas with friends and family have a great Christmas. God Bless. Merriest Christmas Blessings to you, Mary! Thanks so much for this wonderful, inspiring and help-filled blog. I often just get happy just looking at your color choices. This is definitely your ministry. Merry Christmas and enjoy a well deserved rest! I truly enjoy your blog and it is hard to believe that you have been posting for 8.5 years. Your blog is wonderful! As it is already Christmas morn here, I wish you & yours a very Happy and blessed Christmas, staying safe if travelling, and I hope 2015 brings you all the best life has to offer with good health, lots of happiness and good fortune. Thank you for all you do, for the inspirational ideas and tutorials you share daily with us, for your commitment and dedication to all following Needle’ n Thread. Your humour, generosity and added assistance given to all when asked is truly appreciated. I’ve only been following your blog for not even a year yet, but eagerly look forward to it daily. Enjoy your short break & I’ll look forward to your next post. Just wanted to say that your posts are a joy to read! I haven’t yet tried any of your projects but perhaps I’ll get there one day! I’m glad you like it, Pauline! Thank you!